Far Cry New Dawn certainly set tongues wagging last night at The Game Awards, and now Ubisoft have provided some fresh details about their new irradiated adventure. Unlike most post-apocalyptic games, New Dawn features a lush, colorful landscape, which actually has some basis in real life – deserts often experience something called “super bloom,” a period of intense growth and life after a long dry spell. The same principle applies to New Dawn – 17 years after the bombs went off, the world is springing back to life in unexpected ways. You can check out some 4K Far Cry New Dawn gameplay, courtesy of GameSpot, below. Here’s some more, courtesy of the folks at USGamer. And here’s a developer video, which answers the very important question – what happened to Boomer after Far Cry 5? Maybe brace yourself for some bad news. 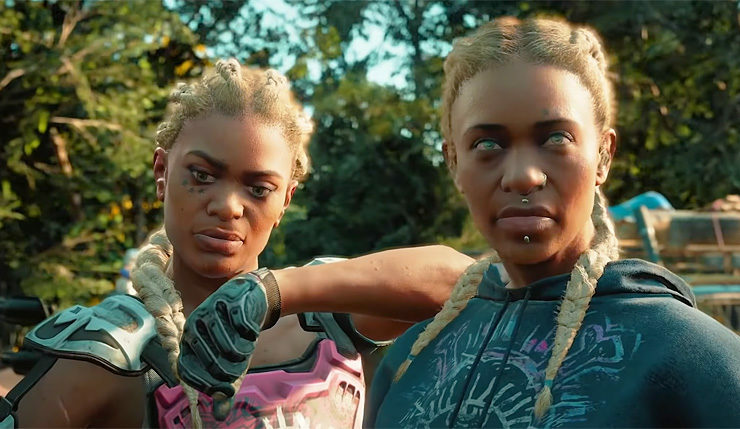 In a new interview with GameSpot, New Dawn writer Olivia Alexander provided some backstory for the Far Cry franchise’s latest charismatic villains, Mickie and Joe, the violent twin sisters who control the Highwaymen. Apparently, the sisters killed their own father to take over the gang, so yeah, like most Far Cry baddies, they’re proper psychos. The Highwaymen aren’t one-note bad guys though – they’re have their own kids, settlements, and society. That said, you’ll still have to take plenty of Highwaymen out, and they promise to be more of a threat that some past Far Cry enemies, sporting varying levels of armor and skill. Of course, Far Cry New Dawn will have all the post-apocalyptic open-world staples – the game places a greater emphasis on scavenging and crafting, and you can work toward rebuilding your main settlement, named Prosperity. It all sounds very Fallout 4. Finally, the game will also include a new type of missions, called Expeditions, that take place outside the main Hope County open world. Expeditions are cooperative, and task players with infiltrating a Highwayman outpost and escaping with a bag of supplies. Based on what we’re seeing a hearing, it doesn’t seem like Far Cry New Dawn is straying too far from franchise staples, although it is trying some new things. What do you think? Eager to try New Dawn or has the apocalypse been played out? Far Cry New Dawn explodes onto PC, Xbox One, and PS4 on February 15, 2019. The game will have a budget price of $40.